The Mariners worked out Joshua Rodriguez a week or so earlier, Rodriguez' father Eddie Rodriguez recalled to MLB.com. Then, the team made Rodriguez its 49th-round selection in the 2008 draft. "He really seemed excited about the way it went," father Eddie Rodriguez told MLB.com after the draft. "He had been going to the [Peoria Sports Complex] to hit in the cages." 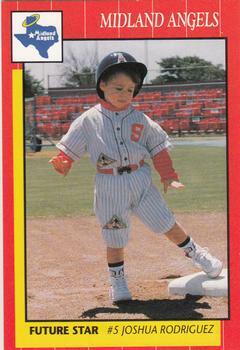 The catcher was likely also excited 18 years earlier, at least in a different way. With his father as manager of the AA Midland Angels, the then-2-year-old son got his own baseball card. Dubbed a "future star" on the card, Joshua Rodriguez didn't quite live up to the billing of star. He did turn out, however, to be a future pro, if only briefly. Taken by the Mariners late in that draft, his pro career lasted all of three games. Rodriguez' time in baseball began all the way back at Midland through his father. Eddie Rodriguez played five seasons in the minors then turned coach. The father then started a coaching and managerial career the began in the minors and ultimately led to the bigs. As Joshua Rodriguez grew up, he followed his father into the game. He graduated from Red Mountain High school in Arizona. Then the Nationals first showed interest. Washington selected Rodriguez in the 47th round of the 2006 draft. Rodriguez, however, turned to college instead of the pros. He went to South Mountain Community College in Phoenix. Then, as his father served as Mariners first base coach, Seattle selected Joshua Rodriguez in the draft. Josh Rodriguez soon signed and the club assigned him to its rookie Arizona League squad. The switch-hitting catcher got into three games, two at bats. He didn't get a hit. Those three games marked the extent of his pro career.